Before I start this review I need to be honest. I love space movies, I love sci-fi, I love operatic story arcs of dying civilisations and grand adventures. So it isn't surprising that I loved Interstellar. From a purely escapist view point it was a wild ride. Visually spectacular, well acted (despite some clunky dialogue – the "That's relativity for you" line and the whole "love is a force that can traverse all dimensions" monologue was a bit like a poke in the eye) and with a fabulous score, Interstellar is at heart a heroic adventure to save humanity. It was very refreshing to find a film with a strong theme of love that didn't turn into a sappy, kiss-to-cheers-of-the-crowd-on-the-closing-credit, love story! The other aspect we appreciated was that the end of the world wasn't portrayed as a massive cataclysmic crisis. Instead the movie's dystopian future was realistically gradual and mundane, with agriculture failing one crop at a time. The only hope for humanity is in a band of scientists, theoretical and experimental, who are planning a journey through a wormhole near Saturn to find a habitable planet for future generations of humans to move to. 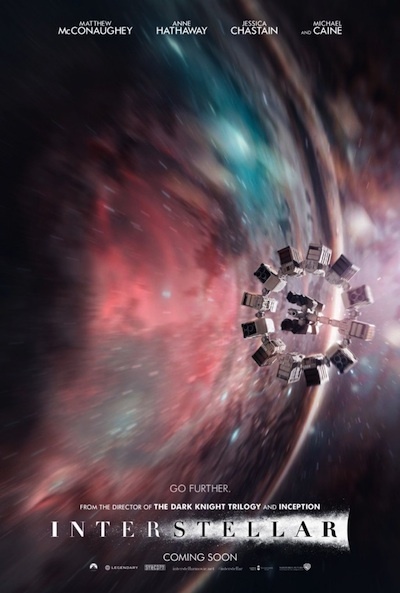 This journey provides most of the movie's dramatic plot points, such as dangerous environments and spectacular interstellar travel through higher dimensions. And integral to the plot is that this journey results in time passing at startlingly difference speeds for the various characters: parents become younger than their children, people are marooned for decades alone waiting for someone's return, a journey that has taken years finally reaches someone for whom only minutes have passed. And most impressively, all of these dramatic elements are drawn entirely from science fact, not science fiction. As well as being a scientific advisor on the film, theoretical physicist Kip Thorne was also an executive producer and was deeply involved in the creative process. He described the development of the film as "brainstorming in the best sense of the word, an artist and a scientist coming at a complex issue together, trying to generate ideas in the context of a story that is just coming into being, searching for interesting scientific ideas that would take the story in certain directions." The film accurately depicts and explores many of relativity's weirder implications. The distortion of time due to the intense gravity of a black hole, the awe-inspiring effects of a tidal-locked water planet, the use of wormholes – rips through the fabric of space-time – for travel to the far reaches of the Universe, are all based in mathematically correct theoretical physics. (You can read more about black holes and time travel in Catching waves with Kip Thorne and Is time travel allowed?) Despite the fact that many aspects of the film are far beyond the technology we have today, as far as Thorne is concerned the only scientifically dubious part of the film is surprisingly mundane: the structural strength of the ice on one of the planets. And Thorne even has a cameo in the film, in the form of one of the robots (some of the most ingenious and mesmerising robots we've ever seen) being named KIPP. Thorne's collaboration has not just resulted in a scientifically accurate sci-fi film, it has also resulted in new science. Thorne told Wired that the film's visualisations of light being bent around black holes revealed new phenomena that hadn't been seen before. The film makers produced their beautiful images of the massive, fast-spinning black hole Gargantua using data and mathematical models from the work of Thorne and his colleagues. It seems amazing that a commercial movie could reveal something that science hadn't seen before, but it came down to a combination of new tools and immense computing power. The effects team created new software that allowed them to visualise the gravitational lensing encoded in the mathematics and they used massive amounts of computing power, generating nearly a petabyte of data. Perhaps most gratifying for a pair of mathematicians watching the film, the ultimate saving of humanity depends on a mathematical equation, that supposedly solves the "gravity problem". We might not have believed that it will be one equation that would solve such a problem, or that it would save us all, but we did appreciate a female mathematician being the ultimate hero of all humanity. But wouldnt a black hole system be a pretty bad place to go looking for candidates for Earth-type planets? Where would light and heat come from?